Beefy gun by NoobixCube is licensed under the Creative Commons - Attribution - Share Alike license. Intended as a stand in for a "bolter" from the 40K universe, this was designed in Tinkercad with the side surfaces intentionally left blank, so the user can sculpt the desired detail on it. As with my coil pistol, there is no grip, so it can be easily attached to an existing fist. 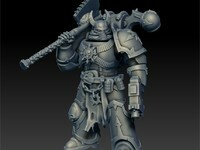 The model is scaled to suit 54mm Inquisitor scale miniatures. 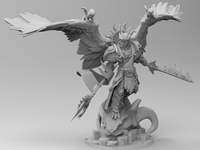 It can be scaled to whatever miniatures you choose. I've kept it generic enough that it can serve as any unrealistically chunky sci-fi gun. 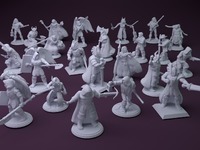 Say thanks by giving NoobixCube a tip and help them continue to share amazing Things with the Thingiverse community. We're sure NoobixCube would love a Tip, but unfortunately they have not setup their accounts to receive them yet.